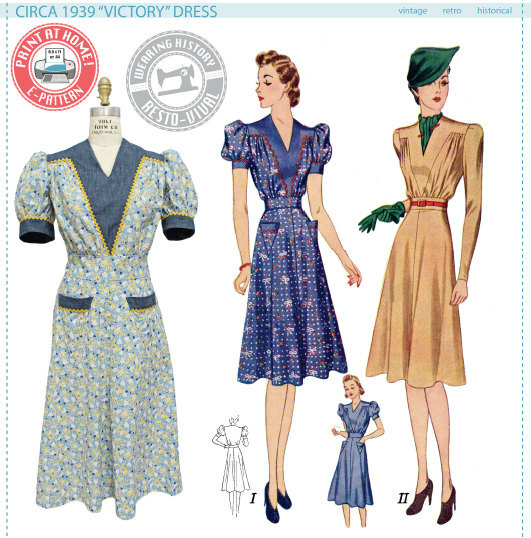 A Wearing History Resto-Vival™ pattern based on an original historical pattern from circa 1939. 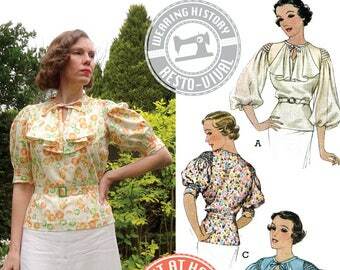 This pattern works well for late the 1930’s through the early 1940’s and is well adapted to novelty prints. THIS PATTERN WAS NOT ORIGINALLY AVAILABLE IN SIZES 30″ Bust, 44″ Bust, or 46″ Bust. Because of this, no layout charts or yardage estimates are included for those sizes. Test your placement when making a mock up to see how much fabric you will need of your final fabric. 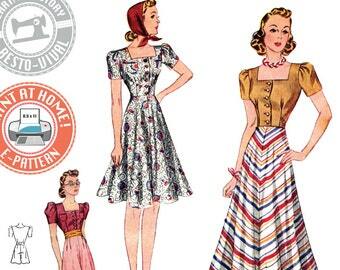 62 total sheets of 8.5" x 11" sized paper or A4 sized paper are needed to make all garments in this pattern. This pattern file is formatted to fit on both sizes of paper, and there will be varying thicknesses of white border, which will be cut off, according to pattern instructions.